Life-long Country Trust supporter, Hunter Adair, was brought up on a dairy farm and studied agriculture as a young man at the West Scotland Agricultural College near Ayr. 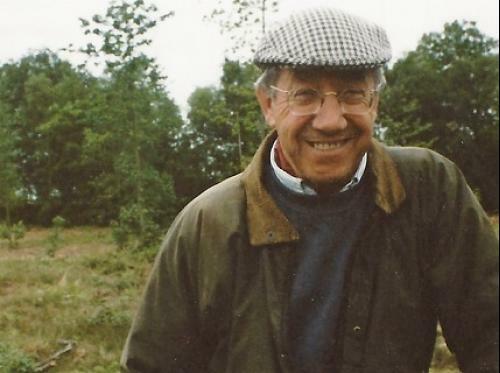 Farming and the countryside is in his blood, so supporting The Country Trust through a legacy pledge was a natural choice because he understands first-hand the benefits to children of visits to the countryside and real working farms. Hunter has had a varied and colourful career, working for the Milk Marketing Board for England and Wales, initially at their cattle breeding centre in Penrith and later as editor for one of their magazines. High points that Hunter is particularly proud of in his life include being short-listed for NFU’s Country Person of the Year and attending a Buckingham Palace garden party. He currently runs the family farm at Hexham in Northumberland and has written and illustrated several books for children and adults about farming and the countryside, as well as producing articles for newspapers, magazines and local radio. Hunter says “I feel very proud to support The Country Trust and believe passionately in the fantastic work they do. I am very fortunate to live on a farm where I learn something new every day from the countryside. This is why for me, it is so important to support an organisation that gives impressionable young children, particularly from built-up towns and cities, the chance to come to the countryside, learn something new and get the opportunity to talk to people from different walks of life. It certainly will. Thank you Hunter. If you would like to find out more about leaving a legacy to The Country Trust, please contact our Fundraising Manager, Claire at [email protected] or telephone 01245 606363.